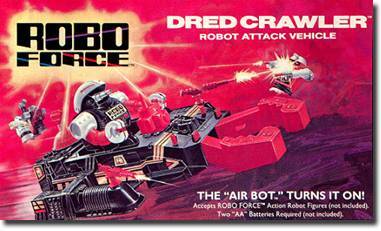 The enemies of the Robo Force attack in this motorized action vehicle, which features a unique air activation system: insert the special "Air Bot" activator into the nozzle on the vehicle, squeeze, and the vehicle starts to move! The "Air Bot" pumps up a balloon that makes the motor start and the periscope rise, indicating fuel status. There's a working pincer attack claw and laser swivel cannons.